I, like many of you out there, are really wondering what the hell is going on right now. Has our country gone crazy? Have we elected a man that is going to bring ruin down on us all? Should we protest? Should we resist? To put it bluntly, this is something our country hasn’t seen before. We’ve had issues before where there were disagreements over how to run the country, but there really weren’t blatant attempts to completely destroy the current political infrastructure in place. There was an implicit acceptance that while you may be a Democrat and the President a Republican, you’d still do your job and be trusted to do so. That trust has been breached. Furthermore, there were norms to ensure that the experts at least had a crack at what was going to be turned into an Executive Order, but that’s gone now too. Our Executive Branch has gone crazy, the rest of the country hasn’t, well maybe the silent majority of the Republicans in office have, but everyone else is still doing the right thing. You see, I think that America should be a shining light on the hill. Our ideals and values, in many ways contentious, really have the opportunity to lift people out of a rough life and into something that is greater. Right now, we aren’t even a flash light shining on a puddle of mud as a government. As a people, we’re doing right by our ideals. Protesting, one of the most American things you can do; welcoming refugees, originally, the US was founded by refugees or asylum seekers – it is only right we continue in this vein. Fighting injustice and oppression – we’ve gotten this wrong, a lot, but we also have had a history of continually moving in the right direction, despite our fits and starts. We Americans are doing this now in the face of what is only the beginning of push back from Trump. We have a pretty clear idea of what will happen to anyone that is a government official and they refuse to obey trump. They will be fired and if possible I’m sure trump will figure out a way to prosecute that individual. 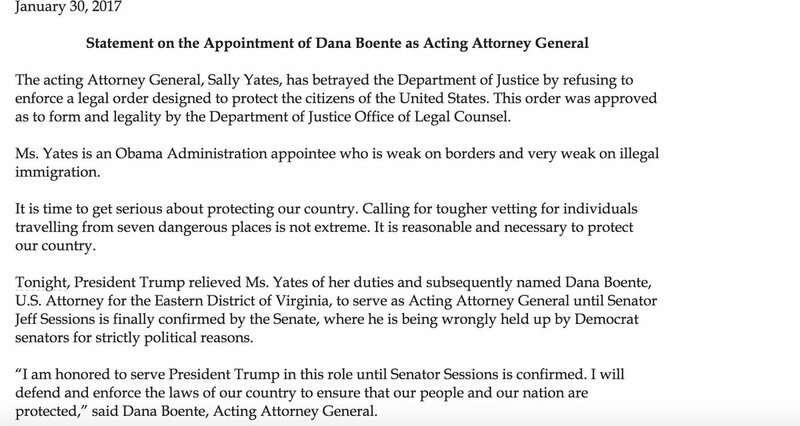 Today, trump fired Sally Yates for up holding her oath as a public servant. His response is absurdly juvenile and was clearly penned by the president himself. Should you protest, though? I think this is a really personal question, but I think that you must protest in some form or another if you want to see this stop. There are many ways to protest that don’t include holding a sign, but you must at least commit time, energy, and possibly money instead. I have already donated $20/month to the ACLU and another $10/month to an anti-corruption organization (which is non-partisan looking to elect both D and R). You can write, you can tweet, you can also run for office. There are a lot of ways to stop this, but you need to decide what you can or cannot do. For me with my travel, it’s difficult to get my bearings in whatever city I’m in to effectively protest. Instead I will write, donate, and support anyone willing to make a difference. I am also working on a podcast with a few friends. The goal, like my goal on this blog, isn’t to preach or really push my ideals, but to try to educate so you can make your own informed decisions. So, let’s make America the shining light on the hill. Let’s fight against corruption, fight to level the playing field so that everyone has an equal chance, fight so that women feel like they have control over their own body, and to fight to make sure that we can take in those huddled masses. This entry was posted in Politics and tagged ACLU, Democracy, Protests, representus, resist, rights, Trump. Bookmark the permalink.